Log Cabin Windows and Doors – What do you need to know? The choice of your log cabin windows and doors, will have a big impact on your log cabin! The external doors and the windows have the greatest affect overall, as these have the most important job to do. They must be strong and secure, to protect your log cabin and also to last well. The thermal efficiency must be good, so heat does not leak out of these areas and increase heating costs and energy useage. The seals must be effective and they should also be a good insulator against sound too! On top of this they must look great and fit naturally with your log cabin. The internals doors are important too, but this is more aesthetical and their specification has less overall impact. Which log cabin windows and doors should you go for? Most log cabins will have quite a number for windows, so your choice of windows is something well worth investigating. There are many different types of window and the overall design and quality does vary considerably. Generally the higher quality the log cabin package is, the quality of your log cabins windows will be correspondingly higher too. Don’t just assume this though, you need to find out for yourself! There is little point in having a budget small garden cabin with top notch windows, neither do you want a large luxury log home which has windows of a poor quality. 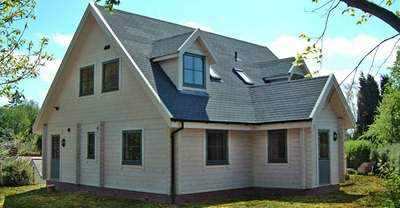 Assessing the important criteria for windows is therefore essential in coming to your own conclusion. 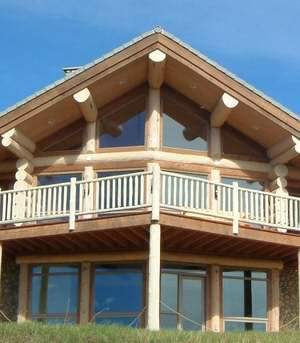 Discover more on log cabin windows. 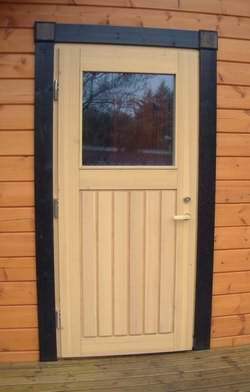 External doors have a large role to play in your log cabin. After all your main entrance door will be used by you, every time you go in and out. A door also gives a lot of character to the outside, so it must be visually appealing, as well as functional. There are many different types of external door, and double doors onto decks or patios are also very popular. These can be in the form of either sliding patio style doors or hinge opening French doors. The amount of glass within an external door is also a big consideration. As the main entry point, security is also vital too. We’ll go over these areas and more, in our external door section. The internal doors are usually quite numerous, so you will want something that looks good in a log cabin and is a decent quality too. Many people will go for solid wooden doors to complement the wood interior, but there are a few options to consider. A more rustic style hand scribed log cabin, will look good with something like barn style doors with wrought iron hinges and handles. If you really want to go for it, some people actually get hand carved doors, although these are going to be pricey! The machined style log cabin, may suit a more modern look. Whichever type you go for, you will need to consider the size (width in particular), thickness, pre-hung or not, material quality and the ironmongery used. Take a more detailed look at internal doors. The species and age of the timber used for your windows and doors and how the units are manufactured and put together, will affect the main overall quality. The use of laminated timber for window frames in particular will greatly strengthen the structure and make it more stable. Look for tight joints and good seals too. Often the overall thickness of the window and door frames, can be a good indication as to the quality. Also open the window and doors and measure the section width of the opening element. You want something which will stand the test of time. Also you need to choose according to the end application. Again a cheap more temporary garden cabin, doesn’t warrant the same quality windows and doors as a log home. We open up the topic of window and door quality here. The safety and security of your family and your possessions, is very important in these days. There are a few key aspects to consider in this regards. In relation to doors, the lock itself and any deadlocks around the door frame are very important. The door must be strong and resistant to any attempted forced entry. Windows again are a potential entry point for unwanted visitors. Do they have the facility to remain partly open, whilst still providing a means of stopping entry? The glazing itself is also worth looking at properly. Also glazing which is close to the floor level will normally need to be toughened to for safety to the occupants. Especially if you have small children, this is very important to check! We reveal more on window and door safety and security. The glazing itself can vary and you need to know what to look out for, when you choose your log cabin windows and doors. The glass type, thickness, gap between double or triple glazing, sealing of the units and any gas which is contained within them, are all worthy of further investigation. In recent years glazing has improved considerably and its’ thermal performance increased significantly. However there can still be quite wide variations between some manufacturers, so we will help to show you what to look for in your window and door glazing. Window and door trim plays 2 very important roles in a log cabin. Firstly it helps to define and enhance the overall look of the log cabin. The difference between a very bland trim and one which has a lot of character, can be quite considerable on the whole building. Also this trim externally plays a key role in dealing with the weather, in particular with precipitation. Drip board style window and door head trim, can be a really nice visual touch and at the same time are great for taking any rain away from the log opening. Also base drip detail is important and the cover provided all round for the logs. Our window and door trim section will explain this in more detail.